Looking back, you can hardly believe that a whole year has passed since you held baby in your arms in the delivery room. Now you see baby attempting to run and jump, and on the verge of uttering his first (or maybe the next few) sentences. Watching baby sleep so peacefully one day, you wonder what is in store as baby grows into his or her second year. This article aims to give you a general idea on what you can expect to see. By 15 months, baby would have gained the strength to push his or her body up from the floor and start walking, albeit slightly unsteadily. His or her grasp would also be firmer, as baby is now able to pick things up and throw them down again, using only the thumb and index finger. At this stage, baby will begin imitating your actions by pretending to speak into a toy phone, or rummage through his or her play handbag. He or she also begins to enjoy dancing to music and will be able to identify certain objects, animals and even people when questioned and point towards them. By now, baby will want to climb up and down the stairs, much to your alarm. He or she will also try to learn to run and jump at this stage. 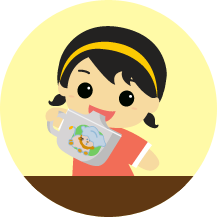 And if you have yet to do it, this is the best time to teach baby to pick up and drink from a cup. His or her cognitive abilities will also become more developed as baby is now able to recognise and remember where you place certain objects within your home. This is also when he or she will differentiate between being scolded or praised by you or hubby. Moreover, baby will begin to understand how people respond to certain things he or she does, and as such, will try to illicit as many smiles and praises from everyone around. Baby will now be able to run and jump, but still with some difficulty, and capable of pushing him or herself around on a tricycle. Baby also enjoys catching or throwing balls and squatting while playing with you. 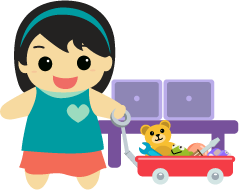 Associating people, animals and objects with their proper names correctly will become easier for baby during this stage. Baby will also become aware that he or she is a separate person from you and begin to express his or her own individuality by using more words like ‘I’, ‘me’ or ‘mine’. This is when you would need to baby-proof your home by installing safety gates at the stairs and keep dangerous items completely out of baby’s reach. Towards the second year is also when you could organise more physical and cognitive activities for your child to help him or her grow stronger and develop quicker.